“The change is about more than evolving tastes; it’s at least partly a reaction to real problems created by suburbs. Their damage to quality of life is well chronicled. For instance, studies in 2003 by the American Journal of Public Health and the American Journal of Health Promotion linked sprawl to rising obesity rates. (By contrast, new research in Preventive Medicine demonstrates, people living in more urban communities reap health benefits because they tend to walk more.) Car culture hurts mental health as well. Research by behavioral economist Daniel Kahneman and his team shows that out of a number of daily activities, commuting has the most negative effect on people’s moods. And economists Bruno S. Frey and Alois Stutzer have found that commuters who live an hour away from work would need to earn 40% more money than they currently do to be as satisfied with their lives as noncommuters. Slowly but surely the pieces are all being tied together by many formerly disparate interests that suburbia isn’t as healthy or sustainable as it was once promoted. Suburbs have their place, for sure, but not to the exclusion of the rest of our developed and undeveloped areas. Natures dislikes a monoculture and the single-minded focus on suburbia as the exclusive panacea to our society’s ills is thankfully being unraveled. Jamie Oliver, the star chef from Great Britain, declared war on processed foods in schools in his home country and achieved fantastic results. He then decided to fire a shot over the pond and see if his success was transferable to the most obese country in the world, the United States. His show, Jamie Oliver’s Food Revolution chronicles his 3 months in Huntington, West Virginia and the 3 months that followed. Why Huntington? Very simply, the Huntington/Cabell County area was determined by the US CDC as having the highest combined rates of obesity and diabetes in the county. More than 1 in 8 residents have diagnosed diabetes and nearly 1 in every 3 are considered obese. But Huntington is not alone in this unfortunate status. Across Appalachia and through the deep south, diabetes and obesity are epidemics with the rest of the country not too far behind. According to the same CDC study, obesity across the US hovers around 1 in every 5 people. Great Britain’s struggles with obesity was what led to Jamie Oliver to begin his food revolution there. Like in Huntington, he began in the schools, where the diet of school children can most easily be monitored and controlled. By rejecting processed foods in favor fresh and healthy alternatives, he and others there are making dramatic in-roads into childhood obesity. So it only made sense to see if he could translate his experiment to the United States. Was he successful? Well yes and no. The six part series on ABC chronicled his six month experience with Huntington/Cabell County’s school district. The thesis was simple. If he could show success in a middle America place like Huntington, WV then surely it would translate across the rest of the country. What he ran in to was no less than a full court press of good old American bureaucracy, beginning with the school district and leading right up to the steps of the US Capitol. From the mountain of irrational dietary requirements put forth by the federal government to the heavily subsidized processed foods that are dumped into school districts across the country, Jamie discovered that this was a long term proposition. My wife and I were dumbfounded at how schools regularly provide, for example, flavored milk products (strawberry and chocolate) that are loaded with as much sugar as sodas all as a means to get children their required daily calcium and vitamin D. Hmmm, take something that children don’t like and saturate it with sugar. What’s next, candy coated broccoli or chocolate asparagus? Very simply, what Jamie ran into was the wall of entrenched specialization. Someone, somewhere convinced the powers that be that it was necessary to ensure that children drank milk. And someone responded by delivering a variety of milk products to ensure that directive was fulfilled. It is a bureaucracy established to control and deliver one narrow policy in absence of a broader picture. In building our cities, many of us have long realized that the same micro-management of minutiae exists in every level of the built environment. The moment you try to approach a problem comprehensively, the specialists all awaken and tell you why their narrow focus must be heeded in spite of their obvious shortcomings when taken as a whole. The stormwater guys have said that all urbanism is bad because it pollutes our water supply uniformly. The traffic guys will make you oversize your streets because that is what the state or national standard requires. And the environmentalists will protect a wetland regardless of how beneficial it really is to the greater ecosystem. The list goes on and on and on. We need more Jamies out there fighting for common sense, a trait that our first world “affluenza” has taken from us. It’s more about consumption that fulfills our short term wants and than prudence for the long-term needs. And people like Jamie who are willing to roll up their sleeves and fight the system – people who are willing to ask “Why do we do it this way?” and who are not willing to accept “because” as an answer. As they say, the revolution starts in the hills. In this case we hope that it’s in the hills of Huntington, West Virginia. Kaid Benfield, a fellow new urbanist and the Smart Growth Director of the Natural Resources Defense Council appropriately summarized in a recent blog post entitled “The Environmental Paradox of Smart Growth” what I have written about in this blog and have spoken about for years. There is no question that sustainable land use requires, among other things, neighborhood density. Indeed, I have basically staked my career on the proposition that we must increase the average density of our new (and, in some cases, existing) built environment in the US if we are to achieve anything near sustainability as we absorb more growth. Nothing has been worse for our environment than sprawl. Smart growth based on walkable neighborhoods, transportation choices, nearby amenities and the accommodation of an increasingly diverse society – more urbanism, if you will – is the only way we can limit per-capita impacts, and thus total impacts, to a manageable level. But we also must be honest with ourselves about something, if we are to get this right: Environmental impacts will occur with development; to limit them, we must concentrate them, and this can mean increasing them in some places. This is what I call the environmental paradox of smart growth. Only if we understand the paradox can we address it. Only if we address it can we really create better places in which to live, work, and play – and surely that, not just lowering pollution numbers, must be our real goal. As real estate begins to emerge from its great sleep of the past two years, one can only hope that trends will changes and be more responsive to the actual changing demographics of this country. For too long we built for a mythical population of people who didn’t exist or never came. Now is the time to be much more mindful of who we are actually building for. And guess what, it’s not the white suburban family of 4 with a dog. That group is shrinking faster than my 401k did in 2008. The population of the United States is projected to grow by about 3 million people per year for at least the next 30 years—representing about 18 million more people in the United States by the end of 2015. This added population will not be evenly distributed across all markets, and where these people settle will vary across city and county submarkets. About one-third of the annual population growth—1 million people—will be traceable to immigration from outside the United States. This group will arrive with different cultural and social attitudes that will affect the planning, design, and buildout of real estate structures. Many of these differences will run counter to historical trends and the growing expectations of generation Y. The number of households without children will continue to rise and will affect rental housing as homeownership rates continue to decline. All real estate, whether already built or future development, will be affected by job growth and the need for new job skills. Where these new jobs are located and the type of jobs they are, as well as the continuing contraction of other job types, will have the single, most dynamic, ongoing effect on real estate. In addition, the length of the commute to reach these jobs and the relative wages they pay will shape development and guide investment. Of course, I think that the last note is perhaps the most important. Job growth drives the demand for real estate. Without jobs, businesses don’t need office or warehouse space, employees don’t move to new cities and buy houses, and retail doesn’t open shop. I think that the last decade lulled too many into a false sense of the market. Not every market could have been white hot because not every market was actually increasing the number of jobs. And while many will say that the real estate industry is a major of jobs in this country, I would contend that they are a dependent industry, not a catalyst. People that make things and sell ideas are the catalysts of our economy. Ignorance of the building blocks of a vibrant economy is just plain ignorant. So too is ignorance of the changing “face” of our population. How many communities have more than 80% of their land zoned for large-lot, single family homes to the exclusion of any other choices. And how many permit small scale, low cost incubator businesses. Can the next HP or Microsoft really be started out of a suburban garage or has it been zoned out? A little more than a dozen years ago, a collection of three adjacent suburban towns in the sprawling Sun Belt region of Charlotte did something extraordinary. After months of public workshops, lectures and community discussions, months of looking at slide shows to choose what kinds of streets, stores, houses and apartments they wanted for their towns, they revamped their town codes. 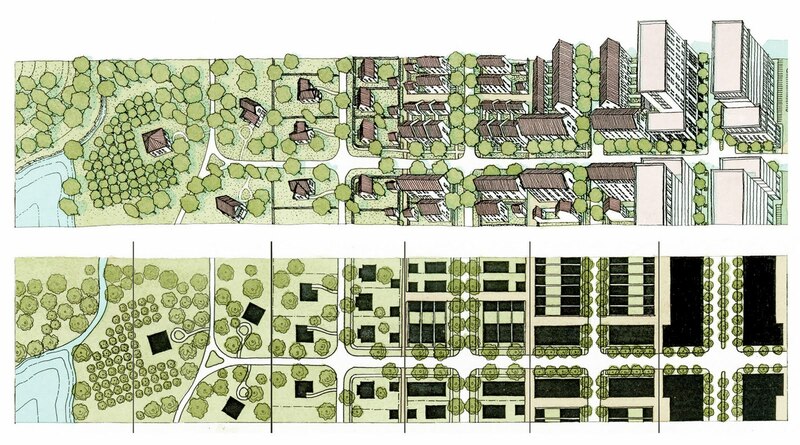 They aimed to discourage conventional suburbia and encourage traditional neighborhood development, transit-oriented projects and farmland preservation. In addition to the turnover and the influx of newcomers unaware of the past work, I suspect a piece of what has happened relates to starker political partisanship and more liberal-versus-conservative tensions in the past decade. Much about traditional neighborhood design might be considered conservative–such as its aim to hold down municipal services costs and its association with small-town values. But once “smart growth” came to be associated with environmentalism, it became a target for many conservatives suspicious of anything favored by liberals. Can a church be moved and still retain its full sense of sacredness and civic prominence? This is the idea that is being explored by Mary Our Queen Catholic Church in Norcross, GA, a suburban Atlanta community. 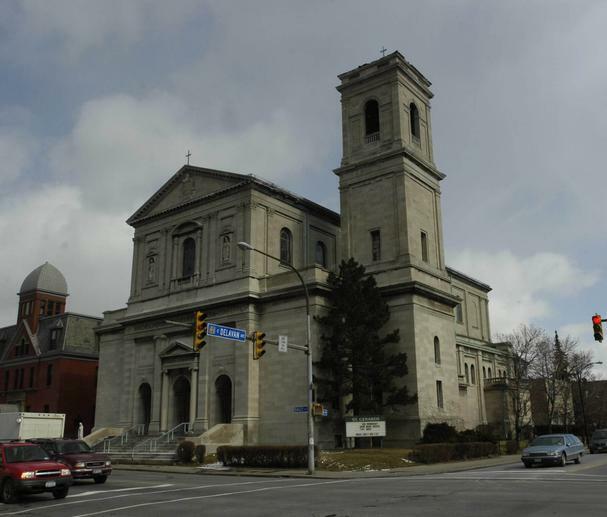 Rather than build a new facility in the pattern of the old ways, this parish is seeking to physically move a recently closed church in Buffalo, NY – St. Gerard’s Catholic Church – piece by piece, fixtures and all, nearly 900 miles to the south. Once relocated, they believe that they can reassemble the 800 seat basilica-style structure designed as a scaled replica of St. Paul Outside the Walls in Rome, and restore it to its former glory except that it will have a growing parish to care for it. As its advocates note, “visitors stand in awe of the magnificent structure – startlingly like the Basilica of St. Paul Outside the Walls in Rome, though one-third its size. The exterior of Indiana limestone, an interior of travertine marble and plaster and twelve solid granite columns lining the nave make the church one of the most solidly built (and easy to disassemble) structures of its time.”To duplicate such a structure would cost in excess of $40 million, while it has been estimated that to relocate it would cost roughly $15 million. Calling it “preservation through relocation”, supporters hope that the continued stewardship of this structure in another location is its last, best chance to save such a marvel. The challenge that this proposal sets forth is perhaps a more elemental one. Today, St. Gerard’s sits on the prominent corner of Bailey Avenue and East Delavan Avenue in the middle of the walkable, urban Fillmore District neighborhood. Unfortunately, the changing demographics of the community led to its ultimate demise. But will its relocation bring a greater honor to this building? 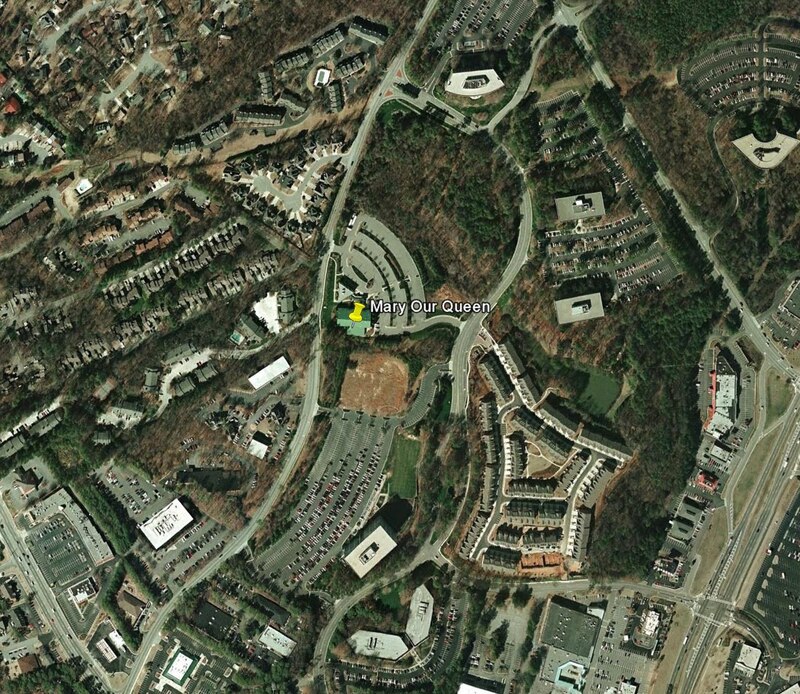 Norcross, GA by contrast is a sprawling suburban area with little character and the current site of the receiving parish is in the middle of an office park. For those that accuse New Urbanists of attempting to create “stage-set” versions of true neighborhoods, one can’t help but see that accusation being played out in a far less-dignified location. What brings dignity to the building is its context. 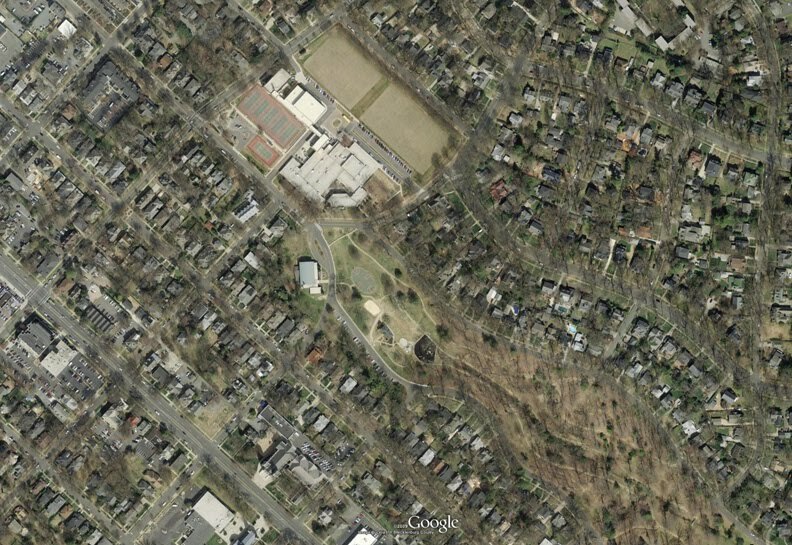 And in St. Gerard’s case the context is one which has a prominent street corner amongst a walkable, urban neighborhood. What little parking they have is behind the buildings, removed from the public realm. Far too often, without the surrounding urbanism like the Fillmore District, most churches built today become much more introverted in their design – patterning themselves after the shopping center and the office building with inexpensive, often austere exteriors surrounded by large parking fields. This is not to suggest that the parishioners of Mary Our Queen are not well intentioned. Nor is it to suggest that we must fight to prevent future “preservation through relocation” episodes. Not true. In many cases, unless the job market radically transforms in these older cities and people begin to re-inhabit them as they did a century ago, many St. Gerard’s will have their only future in another location or they will fall to a wrecking ball. To the casual observer viewing the site from the portal of a Google Earth map, the current location appears to be uninspiring. As a result, I believe that the parish must ask itself whether the final location is dignified enough to receive such a glorious building. Will its new home be prominent enough to proclaim the glory of God to the entire community or only to its own membership? If after spending $15+ million to move and renovate the building would it be better served to spend a little extra to also identify a more appropriate site to proclaim our faith? The study correlated housing values using Walkscore.com‘s results as a basis for walkability. While still not a perfect calculation as it doesn’t yet have enough data to determine the presence of a sidewalk, Walkscore measures the proximity to amenities such as schools, public buildings, and shops that are essential for daily living. The next study I’d love to see is how this data correlates to home foreclosures. I suspect that these walkable neighborhoods would fare equally as well. Just a hunch. Can we re-charter our US cities for success? My company’s headquarters is located in downtown St. Louis. As an urban planner in the new south, my frequent trips to our mothership have granted me the opportunity to explore much of the urbanism, both good and bad, that this region has to offer. And let me say, St. Louis have some absolutely extraordinary urbanism. From historic walkable neighborhoods rich in architectural character to vibrant business districts to its rich cultural amenities, St. Louis provides its residents with the potential for a very high quality of life. For the outsider, most think that St. Louis, at least the city of St. Louis, extends from the Mississippi River to the Missouri River. And with the airport (as a city facility) located not too far from the Missouri River, this is arguably correct. But in reality, the city itself ends as a corporate entity at the western boundary of the 1200 acre Forest Park. Beyond that lies dozens upon dozens of incorporated jurisdictions including large swaths of unincorporated St. Louis County. I suspect that in years past they simply denoted that area as “beyond this there be dragons.” Today, the population of St. Louis County is nearly three times that of the city but is spread across 91 incorporated jurisdictions. With a few notable exceptions such as Webster Groves, Kirkwood, University City and Clayton, many of these cities are little more than incorporated neighborhoods with some comprised of just a few streets and houses. Fourteen of these “cities” have less than 500 people with the smallest one (Champ) clocking in with 12 residents. The result of this “pandemic of place” is evident. Complex taxing structures, municipal inefficiencies, fractured decision-making, and hyper-competitive tax base stealing runs rampant across the area. Some have adapted to these growing costs by creating strategic alliances with neighboring “cities” to contract for services and reduce operating overhead but most are hamstrung by soaring costs (and expectations) and declining revenues. The question I ask myself every time I visit, which has been more than 50 times over the past decade, is whether a city/county with such great urbanism, can ever be truly competitive in the new economy. And unfortunately, I have yet to come up with a positive answer. This answer has nothing to do with its physical structure which is in many ways far superior to a Charlotte or a Phoenix. Rather, what holds it back from truly being competitive on the national or global scale again is the political structure. By my estimate, the regional probably contributes nearly as many politicians per square mile as Washington, DC. (Assuming a minimum of 5 elected officials per city times 91 cities and the County Council equals 450 plus the City of St. Louis’ 29 alderman and one Mayor for a grand total of 490 elected officials – perhaps someone from the local municipal league can provide a more accurate number). Regardless, even if the number is half of that, it’s still too many to provide a truly competitive region with appropriate representative leadership and effective decision making. This issue resonated with me on my last trip to St. Louis as I read the current issue of Harvard Business Review. One of the lead stories was a listing of breakthrough ideas for 2010 and coincidentally one of the issues addressed governance and political structures for competitive cities. Entitled “Creating More Hong Kongs,” Paul Romer, the senior fellow at the Stanford Institute for Economic Policy Research suggests that charter cities can help to change the rules for struggling economies. Focused particularly on the emerging third world, the suggestion was that if a Cuba or an India created a new port city with open-market rules more like Hong Kong than like North Korea, it could help to give a boost to that nation’s overall economy much like Hong Kong’s free-market tendencies have done for the rest of China. So as I sat there and reflected on the thesis, I realized that the opportunity for a truly new city and not just an extension of an existing urban area, while possible in a place like Dubai or Mumbai with rapidly growing populations, is not likely to produce an overwhelming number of new entrants for the first world which desperately needs a means to reinvent itself to better compete on the global scale. Rather, I wondered if this idea of a charter city could extend to the re-invention of an existing city or urban area. How many communities across the United States are plagued by byzantine bureaucracies that are so ingrained that decision making is more like an Olympic sport than a deliberative, predictable exercise? How many places have tried strategic reform when a more generalized carpet bombing was necessary? St. Louis certainly isn’t alone in this, though the sheer breadth of decision makers poses a unique challenge. In other areas of the country, particularly the northeast, the levels of government offer a similar conundrum. Just how many county, township, town, and village governments are necessary to manage the exact same populations that are in fact shrinking, not growing. And even if they are growing, is this still the right approach? Is there leadership, particularly at the state level to impose such a change on areas that are clearly dysfunctional? Cities and counties are, after all, creatures of the state and can be created and dissolved in a single act. And what are the catalyzing events that make such a radical change possible? Does the area have to be so decrepit or abandoned, like parts of Detroit or Buffalo (with apologies to the great areas of both) to bring about this type of change? Even San Francisco, with its beautiful urbanism, is considered by many to be governed by a structure that is one of the most bloated and ineffectual in the country. All of this brings to me a clear focus that in order for cities to thrive in the new economy they must be much more than beautiful, functional, urban places. They must be well governed, from the individual neighborhoods to the Mayor’s office, without being onerous and contradictory to the future vision. Part of this is a discussion on development codes, but it really speaks more to the daily policies of service delivery and business support that a city is best able to provide. So, is there hope for the St. Louis and it’s hundreds of tiny body politics to be positioned for the future? Can they effectively set aside their individual tax base needs to compete in the global economy? The current economics of St. Louis appear more like a shell game, simply moving tax base around, often in the form of new retail centers that bleed off the adjacent jurisdiction. And often, these “projects” have been at the expense of population, forcing whole neighborhoods to move in order for “progress” to occur. And to be fair, they are all doing it. To point fingers would be futile because you would be spinning in circles. And with declining population, most economists will tell you that no new revenue is being created – it is simply being moved around from one shiny new big box to the next. And we also come to understand that the St. Louis region is really on the precipice of becoming a shrinking city, a place where population growth is inversely related to land consumption. How would things be different if St. Louis County were comprised of say, eight to ten cities rather than the current 90 plus? And what if one of those new cities were a charter city with a radically different structure that had previously been imagined before? Because to consolidate and yet to continue the same business as usual is more than a missed opportunity for incremental progress. It might just be a missed opportunity for truly global competitiveness that restores St. Louis to the prominence of centuries past and ensures that we aren’t having the same conversation about St. Louis or Memphis or Charlotte in fifty years that we are having about places like Detroit and Buffalo today. This blog has often railed against suburbia in favor of more urban arrangements of our communities. And while there are a growing legion of those who support this position, there are still a number of individuals who, for many and varied reasons believe that the suburbs are superior and that cities are the antithesis of their dreams. What I have come to understand is that there is a broad spectrum of opinions, experiences, and understandings when it comes to creating great communities. The truth, as always, lies not in the margins of the conversation, but at its core. When it comes to community-building the core of the debate lies often in our definition of terms. And fundamentally it is the fact that “urban” does not universally describe only place like Manhattan or inside the loop of Chicago. In like manner, suburban does not always mean a ranch house on 1/2 acre lot with nothing around for miles to walk to. And the solution to our current unhealthy pattern of development is not for everyone to live in a apartment above a store in the downtown. In fact, our small towns can have urban centers and our cities can have suburban neighborhoods. The term “urban” simply refers to being in a city. A city can be New York with the tall skyscrapers of Manhattan and the 2 and 3 story neighborhoods of Brooklyn or it can be a town like Davidson, NC with its simple Main Street, college campus, and surroun ding neighborhoods. The notion is scaleable but it shares common characteristics. Mixed-use centers with civic spaces surrounded by walkable neighborhoods (that contains parks and playgrounds) and connected by multi-modal transportation corridors. Depending on what part of a great community you are in, this scale could transition block by block or be more elongated. This concept is best illustrated by the transect diagram made famous by Andres Duany and Elizabeth Plater Zyberk. Within the context of the metropolitan area, Davidson, is in fact, suburban. The same can be said of Brooklyn. Neither can be truly sustainable community without access to a larger region of jobs. Like Lake Forest, IL (a classic walkable, mixed-use community to the north of Chicago) Davidson will hopefully be soon linked to the largest job center in the region – downtown Charlotte – via a commuter train. Yet there will still be those who must commute by car to jobs that are outside the core. But even within the city of Charlotte, a majority of the jobs are currently inaccessible except by car – a fact that is changing with a rapidly emerging transit, bicycle, and pedestrian network. But once you arrive into either community – Davidson or Brooklyn – you have an immediate sense of its urbanism within its context. By contrast, suburbia offers no such civic amenities neither within its borders nor in its connections to the outside world. 100% of the embodied value of most suburbs today lies behind the front door. They lack any urban amenities – civic spaces and buildings, multi-modal corridors, walkable, mixed-use activity centers, etc. Most of us who espouse the ideas of smart growth, sustainable communities, and new urbanism (all of which largely share the same set of core principles – making them different flag over the same nation, so to speak) are not anti-growth, anti-car, anti-freedom of choice, raging socialists (or communists, or humanists, or pagans for that matter). Sure, there are folks out there who are in fact opposed to cars and think that we should all live in high-rise apartments under the direction of a strong central government, but they are some of the individuals that I mentioned are in the margins and do not represent the core. In fact, most new urbanist (and old urbanist) planners and designers have helped to create places that are diverse, well-connected, and mixed-use with little government intervention and free-market financing. In Charlotte, NC this includes first ring suburbs of Myers Park and Dilworth (the image below) and newer neighborhoods and centers like Birkdale Village and the Village of Baxter. In St. Louis, this includes most every older neighborhood in the City and newer neighborhoods like the New Town at St. Charles. Does living in one of these places mean that you no longer need a car and that you can live a carbon-free lifestyle (if that is your desire)? Perhaps, but it’s your choice. These places give people choices. They are filled with car drivers and bus riders, families with children and single-person households, avid gardeners and lawn mowers, efficiency apartments and detached houses with yards, driveways and alleys, trees and pavers, Democrats and Republicans, Priuses and Ford F-150 Trucks. The debate about the future of our communities and our future quality of life should be centered around our ability to make choices not our subjugation to a one-size-fit-all approach of modern suburban development. This includes choices for the developers who are the ones who create most of what is built as well as the tenants in the office buildings and the homebuyers who will be the daily users of that community. Great cities can have vibrant, walkable, and mixed-use suburbs that are connected by multi-modal transportation networks. To paraphrase Vince Graham, a new urbanist land developer, most suburbs simply sell privacy and exclusivity, making each incremental addition a degradation of the original promise. Cities, and by extension all urban places (towns and villages included), add value to the greater community with each new home, civic space, street, or neighborhood center. Value is shared in the sense that all boats rise with good urbanism. To close, as we look forward to a new year, let it be one in which communities across the country make development decisions that provide the greatest return not only for the residents of today but for our children, our grandchildren, and future generations. Edward Glaeser, a Harvard economics professor recently posted a blog on the NY times entitled “What Makes Cities Great“. For those communities who rest too much on a single laurel, there are some lessons to be learned here. The text of the blog is below along with the original links. Was coal a curse to Pittsburgh? Did cars destroy Detroit? Does the dominance of a single industry destroy the innovation and entrepreneurship of a region? If it does, then the economic crisis may have actually helped New York by enabling the city to avoid an over-concentration in finance. For decades, economists have debated the “ Dutch Disease” and other ailments associated with too much success. The discovery of natural gas in the North Sea supposedly helped to de-industrialize the Netherlands by raising exchange rates and making Dutch manufacturing less competitive internationally. Almost 15 years ago, Jeffrey Sachs found a negative correlation between resource abundance and economic growth in the developing world, perhaps because those resources fueled conflict and enabled dictators. Can some types of prosperity imperil cities as well as countries? The American Rust Belt is full of places like Buffalo, Cleveland and Detroit that became rich a century ago because of access to natural resources and that are now less prosperous. But the examples of cities that were once richer than they are today proves only the vicissitudes of urban fortunes, not that resources lead to poverty. Still, Benjamin Chinitz’s comparison of New York and Pittsburgh, which I referenced two weeks ago in a post on cities and entrepreneurship, suggested that Pittsburgh’s abundance of coal led to large, vertically integrated steel companies that proved to be incompatible with small-scale entrepreneurship. Chinitz claimed that an absence of entrepreneurs was responsible for Pittsburgh’s mid-20th century stagnation. Was Chinitz right? Did an abundance of natural resources in the industrial age lead to manufacturing giants that crowded out smaller, more innovative start-ups? There are myriad theories that could explain a negative connection between natural resources and subsequent urban innovation. In my post two weeks ago, I described the evidence connecting employment growth with an abundance of small firms, rather than a few large establishments. Too much coal can, as it did in Pittsburgh, lead to the establishment of a few dominant companies, like the vast enterprises managed by Andrew Carnegie and Henry Clay Frick. The problem of big companies becomes more severe if they are vertically integrated. William Kerr and I examined the distribution of manufacturing start-ups and found that new establishments were particularly common in places with plenty of independent suppliers. If abundant natural inputs lead to vertical integration — a steel company combining with a coking operation, for example — then this can also crowd out subsequent innovation. A resource curse can also occur if success of one sector eliminates industrial diversity. Forty years ago, Jane Jacobs wrote “The Economy of Cities.” In it, she argued that new ideas that come from combining old ideas, and places with plenty of diverse old ideas are more likely to come up with big breakthroughs. Michael Bloomberg’s success as an entrepreneur, for example, came from combining technological know-how and insights into the needs of financial services professionals. That combination was easier in New York City, which had both sectors, than in Silicon Valley, where computing innovators were more isolated. Twenty years ago, I was an author a paper that suggested that such cross-industry connections were important for growth. Natural resources can also deter growth by lowering levels of education. Edinburgh is more prosperous today than Glasgow, in part, because it was less successful as an industrial town and therefore attracted fewer less-skilled workers. An abundance of natural resources can also increase the opportunity cost of schooling. Two economists who looked across American states found that resource-rich states have done poorly, partially because of less investment in schooling. As my colleagues Larry Katz and Claudia Goldin have shown, natural resources, like the rich black soil of Iowa, can lead to more schooling, especially when there is little work for children to do over winter months. But they also found that humming industrial cities were laggards in the American high school movement, at least until the Great Depression left their teenagers with little to do except for going to school. The most important natural resources possessed by every old American city were waterways. Before the 20th century, the costs advantages of boats were so extreme that the location of all of America’s 20 largest cities from the oldest, like New York and Boston, to the youngest, Minneapolis, was determined by flows of water. Those waterways ultimately provided connections and connections were and are valuable. New York was certainly not cursed by its harbor that gave it worldwide connections and that led to the growth of the garment industry, printing and publishing and financial services. I’ve always thought that the resources aren’t really a curse, but relying on them too much is a mistake. As we look forward, it always worth remembering that America does not prosper because of its “amber waves of grain” but because the nation’s human capital, especially in its “alabaster cities,” thrives in a connected world.